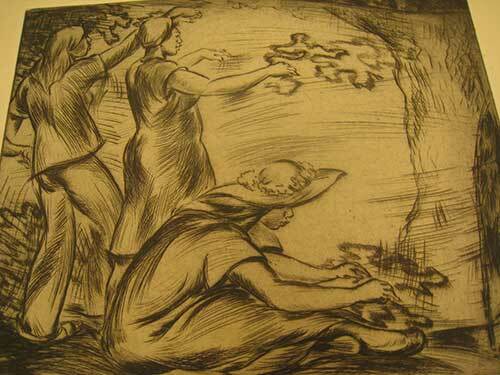 Photographs of drawings, water colors, and oil paintings from Juliette May Fraser's Women at War series. 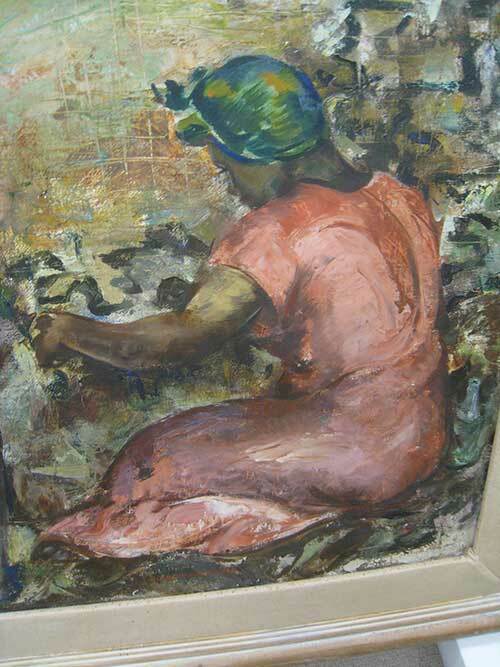 Background: Honolulu Museum of Art maintains much of Honolulu artist Juliette May Fraser’s [1887-1986] work from her Women in War series which included WWII lei sellers. 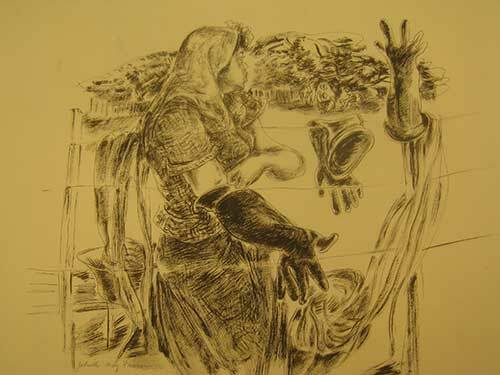 The art work was later published in her book, Ke Anuenue (University of Hawai‘i Press, 1952). 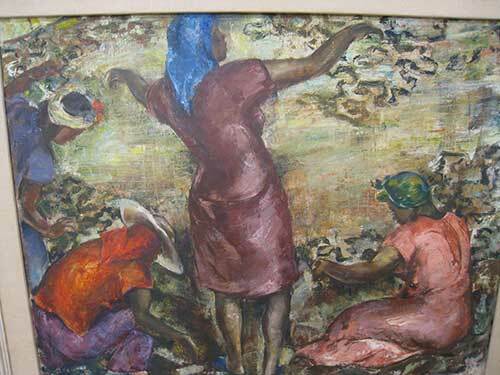 The display invites event guests to experience these works through photographic examination and informal discussions with Honolulu Museum of Art docents and Youth Historians. 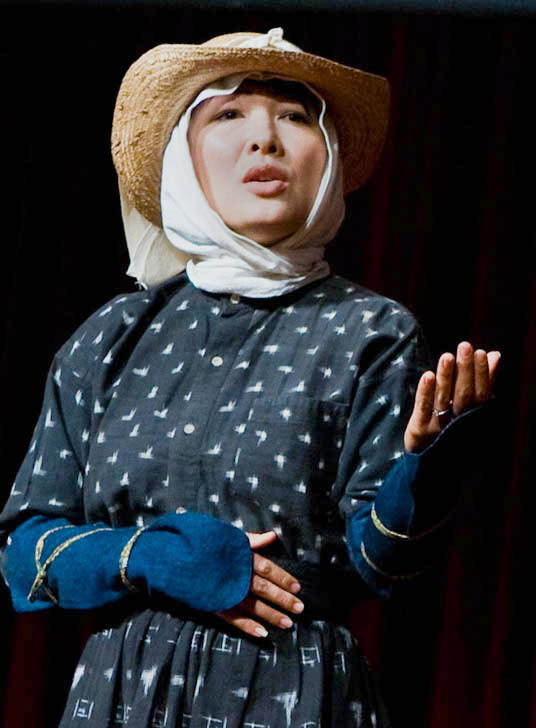 Cultural display of Korean artisan items typically the purview of Korean women, to include textiles such as Bojagi which is a traditional Korean wrapping cloth, embroidered works, and other textile samples. Artisan demonstrations include Korean calligraphy which is the Korean tradition of artistic writing in Hangul or Hanja, respectively the Korean alphabet and Chinese characters. Many scholars of Korean calligraphy used hanja until the 1910-1945 Japanese occupation of the Korean peninsula. Nationalist sentiments following the end of the Japanese occupation, led to the popularization of the native hangul alphabet and calligraphic work in hangul has since seen a revival. 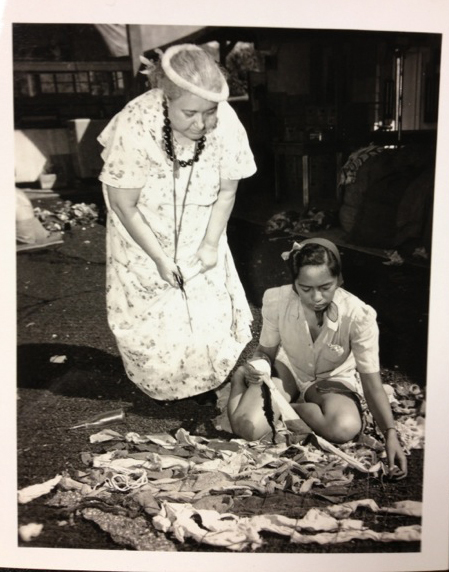 A kimchee demonstration is included as the Korean Women's Relief Society of Hawai‘i used their cooking talents in fund raising for women and children in occupied Korea. Kimchee, cod fish mix, and Korean rice cakes (dduk) were typical of their door-to-door fundraising drives. 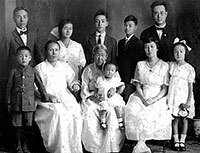 Sponsor: Korean American Foundation, Korean American Women’s Club of Hawai‘i, in cooperation with the Center for Korean Studies at the University of Hawai‘i at Mānoa. 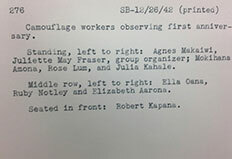 Hawai‘i History Day exhibit The Sting of a W.A.S.P: Evolving Traditional Views of Women's Rights in Flight. 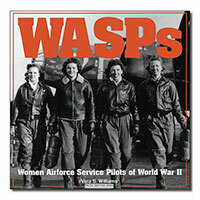 Student project on the history of the U.S. Women Airforce Service Pilots (WASP) of World War II. Hula Ki‘i (Hawaiian puppetry) and rare hula implements from the tradition of Nona Desha Beamer (1923-2008), Co-Founder of Hula Preservation Society (HPS). 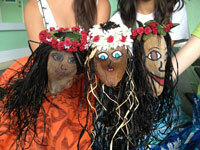 Keiki Dancers taught by Kumu Maile Loo-Ching, Executive Director of HPS. 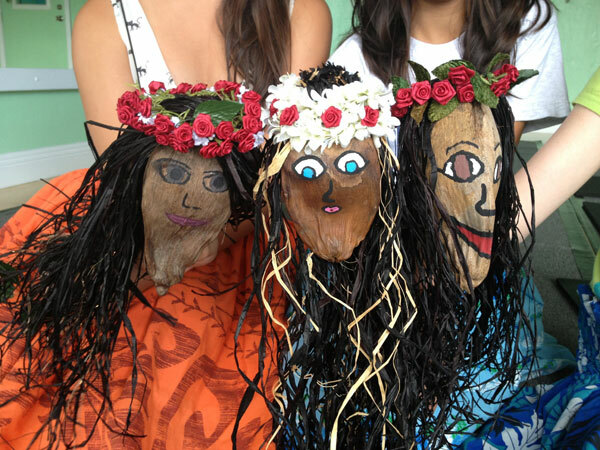 Opening oli by Ka‘ala Estores Pacheco, Junior, California Polytechnic State University at Pomona, Kamehameha Schools Class 2010. 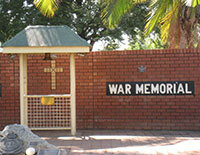 Dedicated to the honored memories of all military and civilian casualties of World War II, current conflicts, and the wars in between. This tribute uses the universal language of music to free the pain and lingering anger of lives torn apart by war, tragedies of every magnitude, dislocation, and family divisiveness. Presenters: Introduction by Reginald Padilla, Director of UH Jazz Ensemble, University of Hawai‘i at Mānoa. Featuring UH Jazz Ensemble trumpeters, trombone, and chimes musicians. The story introduces the wide variety of USO programs women participated in and the entertainment range showcasing dancing women. 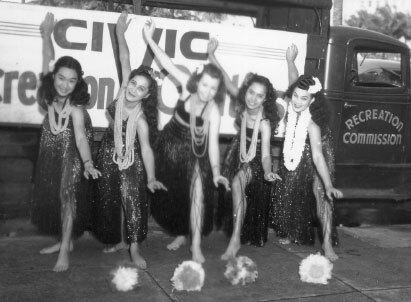 The dance forms of the era included hula, swing, social dancing volunteers, and the burlesque dancers from Honolulu's notorious River Street who all rode the USO entertainment circuit to rural military and war worker camps across O‘ahu and throughout the Territory of Hawai‘i. 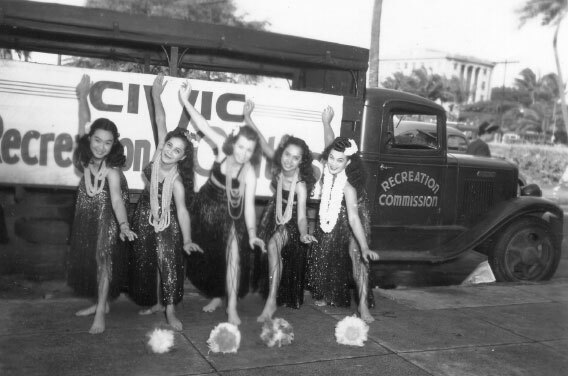 Traveling hula dancers sponsored by the Honolulu City Civic Recreation Commission, 24 March 1942. Photo 309, Hawai‘i War Records Depository. Reprinted with permission of the Honolulu Star-Bulletin. 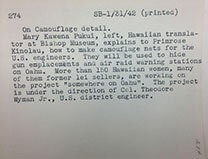 Also shared are the USO venues sponsored by Princess Abigail Campbell Kawānanakoa and her sister Alice Kamokila Campbell who extended Hawaiian hospitality in the use of their homes as USO retreats for the duration of the war. 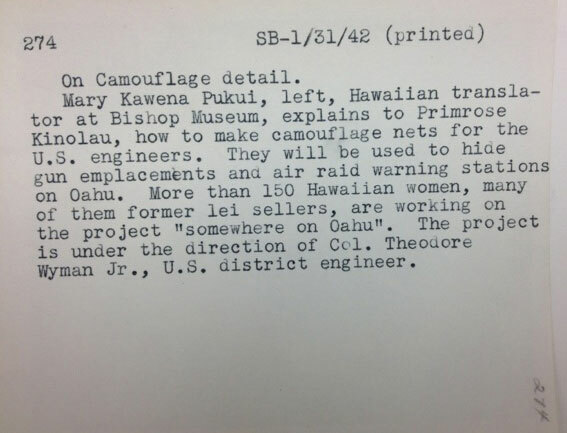 Princess Abigail provided her Mālaekahana/ Kahuku beach house, affectionately referred to as the “Princess Home USO”. Additionally, her home on Honolulu’s Pensacola Street became the first US enlisted women’s club which the Princess named “Hui Welina”. Kamokila’s home, Lanikuhonua, a Ko Olina beach retreat, became a showcase for hula performance and a safe place for servicemen to learn to swim. 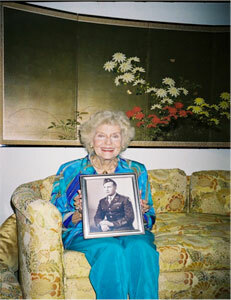 By some estimates her Ewa Beach estate hosted 350,000 servicemen over the course of the war. The unseemly realities of Hawai‘i's racial segregation as experienced by African Americans is introduced through the story of the USO Rainbow Club which served blacks service men and was a popular venue for black entertainers. Presenter: Amanda Carona, Staff Historian at Pearl Harbor's WWII Valor of in the Pacific National Monument, includes musical performance of Boogie Woogie Bugle Boy featuring the University of Hawai‘i Jazz Ensemble. Explores notable female jazz and blues vocalists who impacted the music and entertainment history of Hawai‘i during the war period. The presentation focuses on the 1940s era music of "Lady Day" Billie Holiday [1915 - 1959], Ella "Queen of Jazz" Fitzgerald [1917-1996] and "Queen of the Blues" Dinah Washington [1924 - 1963]. Their music was imitated in downtown Honolulu and Waikīkī clubs, USO performance venues, live radio broadcast performers, and saturated Territorial air waves of the KGU and KGMB commercial radio stations and across the Pacific regions' Armed Forces Network Radio. Their vocalist styling also influenced Post-War jazz songstress Ethel Azama who was born and raised in Honolulu and was of Okinawan ancestry. 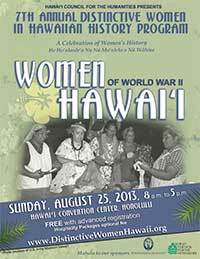 Explores notable female jazz and blues vocalists who impacted the music and entertainment history of Hawai‘i during the war period. 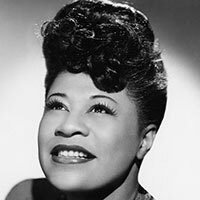 The presentation focuses on the 1940s era music of “Lady Day” Billie Holiday [1915 – 1959], Ella “Queen of Jazz” Fitzgerald [1917-1996] and “Queen of the Blues” Dinah Washington [1924 – 1963]. Their music was imitated in downtown Honolulu and Waikīkī clubs, USO venues, live radio broadcast performances, and saturated Territorial air waves of the KGU and KGMB commercial radio stations and across the Pacific regions’ Armed Forces Network Radio. 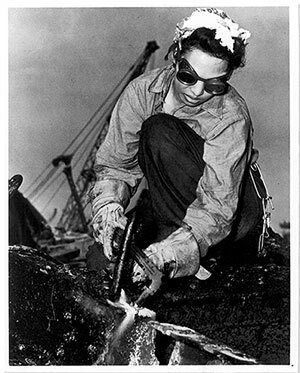 Their vocalist styling would also influence Post-War jazz Honolulu songstress Ethel Azama who was of Okinawan ancestry. Presenters: Guitarist and jazz and blues historian Chris Vandercook of Hawai‘i Public Radio, with jazz vocalist Kimberlei Bradford and Reginald Padilla, Director of UH Jazz Ensemble, on tenor saxophone and keyboard. 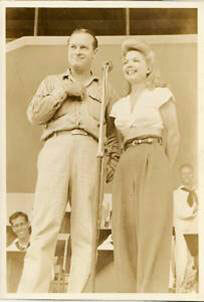 Introduction by Territorial Airwaves historian Harry B. Soria, Jr. 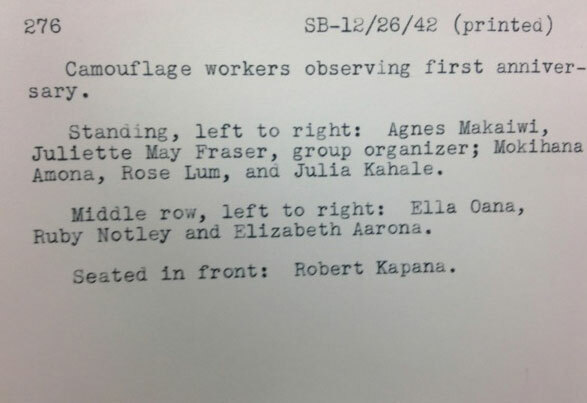 Following the Japanese attack across Oʻahu on December 7, 1941, lei makers were one of the first groups of women to volunteer in the war effort. 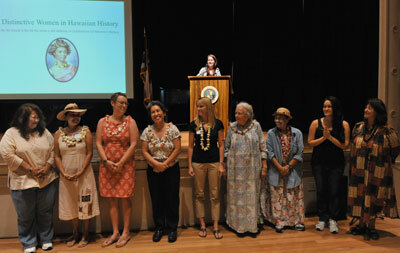 Under the leadership of Lei Makers Association President Agnes Makaiwi, and joined by Hawaiian scholar Mary Kawena Pukui and kama‘āina (Hawai‘i born resident) artist Juliette May Fraser, the lei makers brought their incisive knowledge of weaving island color to the new art of camouflage net-making. 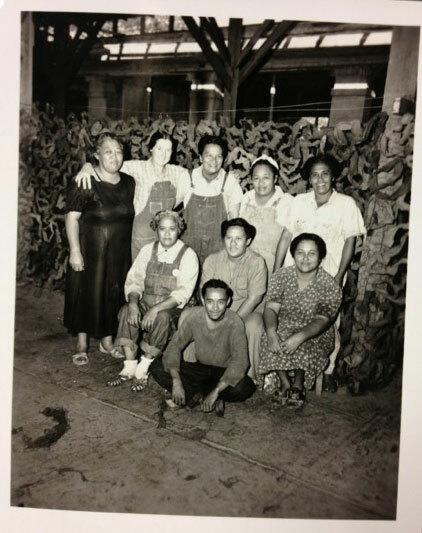 These artisans became the Pacific Theater's premier camouflage net makers from the Kalihi Camouflage Factory housed in Kamehameha Schools dairy farm buildings. As the camouflage net shortage eased across the Pacific Theater, their production shifted to making tropical furniture for the war zone. Arriving with the first wave of Korean immigrants to work on Hawai‘i's sugar plantations, Dora Moon [1877-1971] was a pivotal organizer of a modern Korean women's movement in the Territory of Hawai‘i responding to the Japanese occupation of the Korean peninsula. 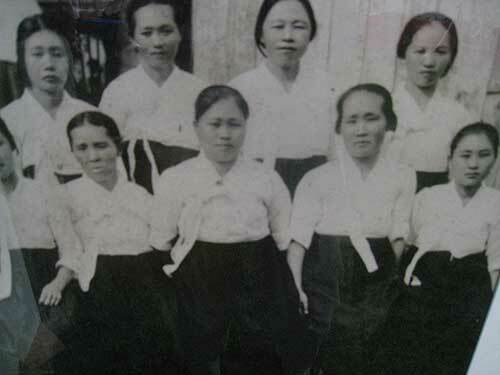 Following the "March 1st Movement" in Korea in 1919, which resulted in scores of Koreans killed, beaten, or arrested by Japanese military authorities, Moon organized Hawai‘i's Korean women in social activism by forming the Korean Women's Relief Society whose activities and convictions supported women and children in occupied Korea throughout WWII. Gourmet Turkey Sandwich on fresh baked whole wheat bread, served with chips, whole fresh fruit, mint, and beverage. Flame Grilled Italian Vegetables with Mozzarella on fresh home-baked Focaccia Bread served with chips, whole fresh fruit, mint, and beverage. Note 1: Break may be slightly shorter if morning session runs long. Note 2: Personal food containers and beverages (other than bottled water) cannot be brought inside Theater 310 nor be stored in adjacent Charlot Courtyard. 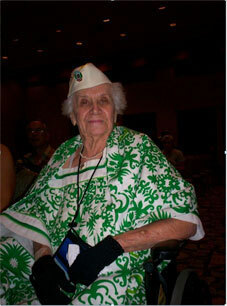 The Pearl Harbor Survivor ranks included 200 Army and Navy nurses serving on that fateful day, Dec. 7, 1941. These medical first responders were assigned to Hickam Field Base Hospital, Tripler General Hospital on Fort Shafter, Schofield Hospital, Pearl Harbor Hospital, Navy hospital ship USS Solace (moored in Pearl Harbor), and later supporting Aiea Naval Hospital (opened Nov. 1942, present day Camp Smith) and converted hospitals at Farrington High School and Kamehameha School. 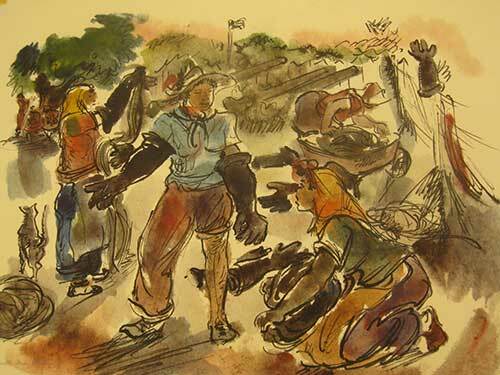 Eye witness accounts reveal military nurses served patients with distinction and compassion, yet their place in medical history and community memory is largely overlooked. 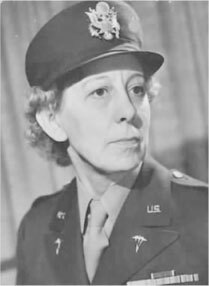 Explores America's first female military aircraft aviators including instructor pilot Cornelia Fort who trained Army Air Corps cadets in Hawai‘i, 1930s aviation pioneer Jackie Cochran, and Chinese-American pilot Margaret "Maggie" Gee. These 1,074 women performed non-combat WWII flying missions and ferried almost all aircraft manufactured during the war, thus freeing male pilots for combat overseas. 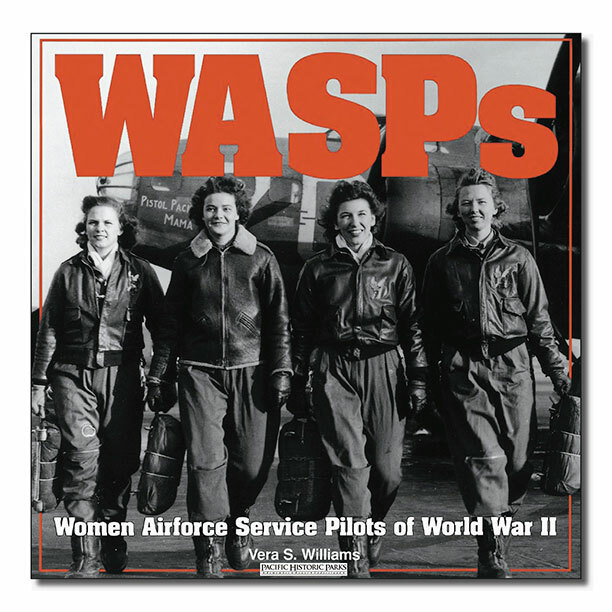 The story reveals how the upheaval of war profoundly changed these WASP pilots and cemented aviation aspirations for future generations. 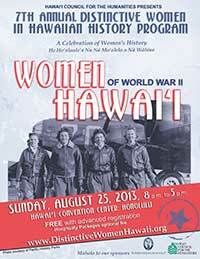 Presenter: Vera S. Williams, author of WASPs: Women Airforce Service Pilots of World War II (Pacific Historic Parks, 2011), joined by legacy female pilots representing the United States Army, Navy, Marine Corps, Coast Guard, Air Force, and the Hawai‘i Air National Guard. Elevating women’s storytelling in the National Parks across Hawai‘i, inclusive of the roles played by native women at Kalaupapa on Molokaʻi, women of color, and the Japanese American women of the internment experience of O‘ahu’s Honouliuli Camp. Presenters: Eileen Martinez, Chief of Interpretation from Pearl Harbor’s WWII Valor in the Pacific National Monument with Internment Survivor Amy Hiratzka Mizuno, age 91, of Honolulu. Music introduction Remembering Pearl Harbor sung by Hawaiian Music Hall of Fame member Noelani Māhoe and author of Nā mele o Hawai‘i Nei: 101 Hawaiian Songs. Introduction by Park Superintendant Paul DePrey, WWII Valor in the Pacific National Monument. Background: Hawaiian Music and Musicians explains "the term hapa-haole has traditionally referred to a song with predominately English lyrics interspersed with one or more Hawaiian words". The era typically includes 1915 through 1959 statehood. 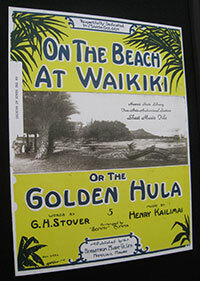 During the 1930s, Hollywood enthusiastically embraced hapa haole, most notably in awarding the 1938 Oscar for Best Song to Harry Owens for Sweet Leilani featured in the film Waikīkī Wedding. Presenters: Hawaiian songstress Marlene Sai and Kumu Hula Michael Pili Pang with Hālau Hula Ka No‘eau. 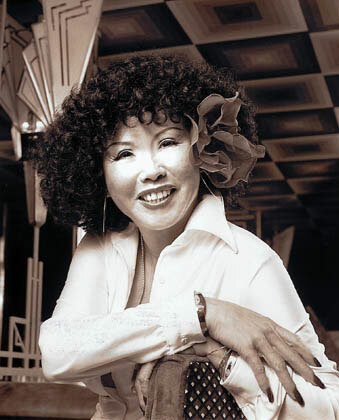 Marlene Sai started her recording career soon after graduating Kamehameha High School. One of her most notable albums was the 1959 recording, Kainoa, which featured Sonny Chillingsworth on slack key guitar and Don Ho on the organ. Marlene headlined at the Royal Hawaiian Hotel's storied Monarch Room. 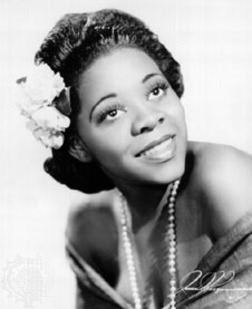 Her signature song, Waikīkī, was written by her uncle Andy Cummings. 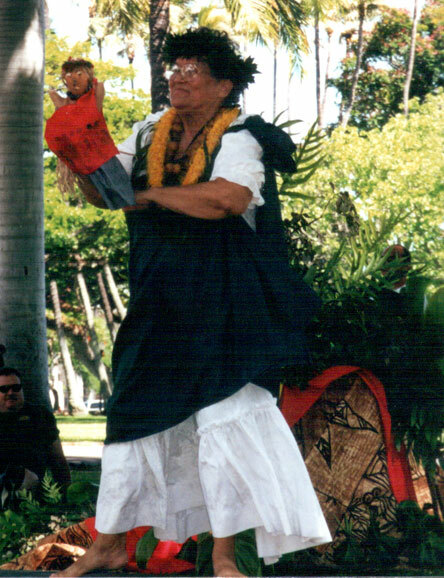 In 1987, Marlene starred in a one-actress play called Hear Me, O My People and the PBS documentary Betrayal both portraying Queen Lili‘uokalani, Hawai‘i’s last monarch. 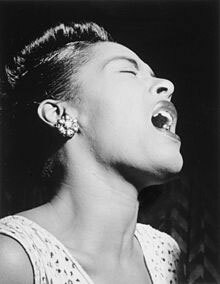 Her illustrious singing career included a 2008 concert in New York City’s Carnegie Hall. 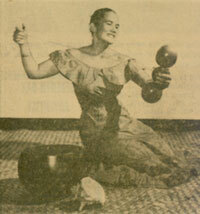 Closing Ceremony: Hawaiian Music Hall of Fame member Noelani Māhoe singing E Kolu Mea Nui (The Three Greatest Things) by Robert J.K. Nāwāhine circa 1925. This song reminds us that the greatest gift we can share is that of love. 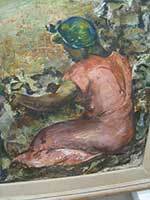 The printed program will feature short essays on the legacies of women cultural treasures who have passed away since our last program.